eMoney is a web-based tool providing account aggregation so all of your investments can be viewed in one comprehensive, convenient and secure portal. This includes a digital vault so you can store important documents and access them from anywhere in the world. It’s like having a file drawer and a bank safety deposit box together online. By combining investments on this one platform, we can generate aggregated analytical reports to monitor, track and address your needs. From analytics to cash flow to pro forma modeling, eMoney helps you manage your budget, have information at your fingertips and project future scenarios. This mobile-friendly web portal is available 24-7. 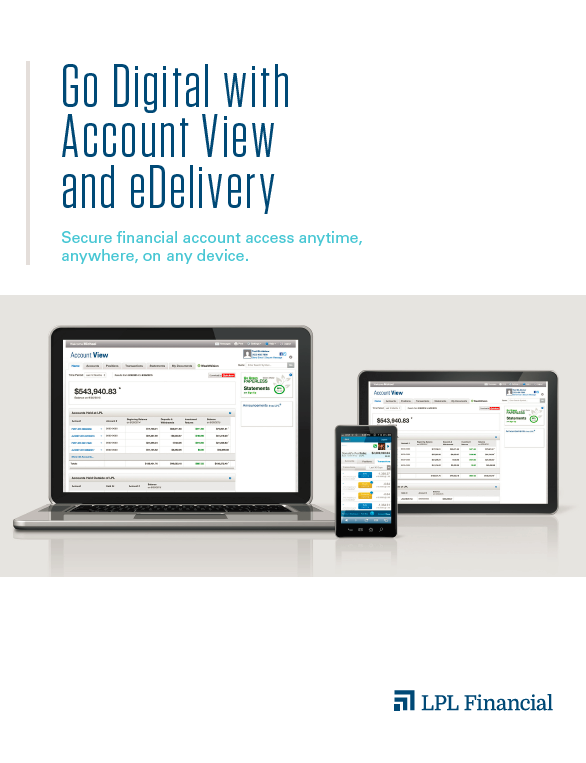 With Account View, you have convenient online access to your investment account information, portfolios, quotes, market performance and news about relevant topics. Welcome! LPL Financial is proud to have partnered with your financial advisor as they continue to provide the most comprehensive financial services available today. Please log-in to access your current account holdings, transactions, and consolidated statements via Albridge Solutions' secure network. You are invited to take advantage of this convenient resource often from anywhere in the world on our secure website.